He asked about the impressions around her waist, on her shoulders. ‘This is from what you wear?’ His fingers, rough against her skin, traced a curve from just under her breast to her navel. ‘It is so tight? This must hurt.’ She was embarrassed. He’d never turned off the lamp on the table. It was just a reading lamp, but the dim halo of light reached the bed. Despite her best efforts to relax, to concentrate on what she herself was feeling and seeing, she’d been so aware that she was visible to him, not covered in darkness as she’d been with Alan. And now, after, it seemed her fear was founded: there was something strange about her naked body, something she hadn’t known was strange. Did other women have marks from corsets? Cora guessed, just from his reaction, that his wife hadn’t had marks. Immigrant women didn’t always wear corsets, especially if they worked. But did other women like her have marks? There was no way to know. Even while giving birth to the twins, she’d had a sheet over her, draped to her knees. No one had seen her bare belly since Mother Kaufmann stopped giving her baths. observations: You couldn’t read this book and not be aware that Cora wears a corset – it’s mentioned 28 times, and never positively. She has many such realizations of the restrictions of her life, and in fact it is salutary for the reader to be reminded that Cora has difficulty bending down to pick something up, and can’t eat much while wearing her corset. The lives of modern women choosing to wear a corset top are very different. This is a fascinating book, using Cora’s life to map most of the 20th century in changes of attitude and morality. The compromises she reaches, and the lifestyle she eventually manages for herself, can seem unlikely, but you really want her to be happy…. Links up with: The Chaperone has featured before, and other Dress Down Sunday entries can be found by clicking on the label below. 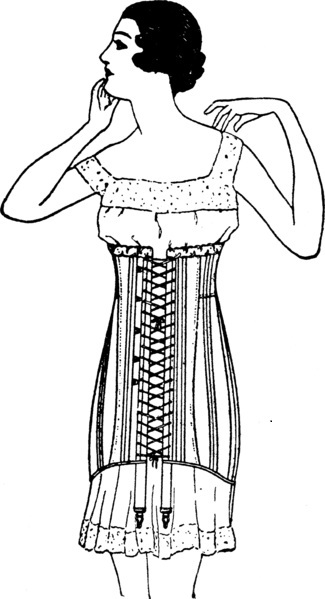 Corsets were important in Louisa May Alcott’s Eight Cousins (the photo of the corset shop is one of the most popular on the blog), and, perhaps surprisingly, Esther’s friend in The Bell Jar is wearing one in the 1950s. The picture is from a 1922 catalogue, and can be found on Wikimedia Commons.